If you're heading to Nepal for a trekking expedition, expect to stay in the basic lodges that have sprung up along all the popular trekking routes in the Everest, Langtang, and Annapurna regions. Known to travelers as “tea houses,” these mountain shelters are a welcome sight after a tough day of trekking. But what exactly is a “tea house”...? Tea houses are accommodations along trekking routes in Nepal that offer basic lodging and meals. Many Sherpas in the Everest region own and operate tea houses along Everest’s trekking routes. To the west, the Annapurna region is protected in a vast conservation area managed by the National Trust for Nature Conservation (NTNC). Tea houses in the Annapurna are monitored by the NTNC and must meet specific requirements including fixed pricing, standard menus, and limits on how many tea houses can be built along specific routes. In lower elevations, tea houses may be multi-story concrete buildings with private rooms and attached western style bathrooms. The further you hike up, the more basic the accommodations get. Base camp may include a dorm style shared room, boiling water (because it’s all frozen! ), and a game of cards by solar light to conserve energy. Every tea house has one large communal dining area with a wood burning stove in the center. It’s a great spot to meet other trekkers, swap stories, warm up, and sip tea while you watch the sunset over the mountains. Domestic tourism has skyrocketed in the past 6-7 years, and the growing number of Nepali trekkers coupled with an influx of international travelers can lead to overcrowding in the high seasons. 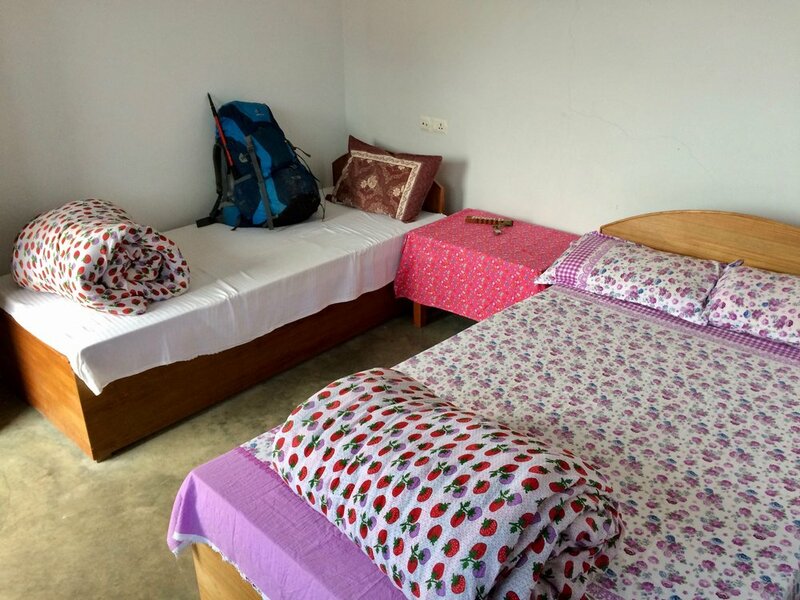 At higher lodges, some travelers may sleep in the community room on extra cots or even tables if all the rooms are full. Most tea houses more than a days walk from a town have a similar setup; two to three twin beds in every room, one overhead light (that works sometimes), a window and personal lock and key for your door. The beds are generally comfortable with a foam pad, pillow, and a blanket. We always ask travelers to bring a sleeping bag to ensure that you stay warm enough at night, and there is no guarantee of cleanliness when it comes to shared beds and sheets. A sleeping bag, or at least a liner in the warm months, is always a good idea. A solid pair of earplugs will also help ensure a good night’s sleep. We always try to reserve single rooms for travelers who request it. At times, the trail gets so crowded that trekkers may be asked to share rooms to save space. While not ideal, it’s just a fact on the trail as tea houses are limited and everyone needs a place to sleep! Tea houses will either have western style (sit down) toilets or the more traditional squat toilets found across Nepal. You never know which on you’re going to get, but the higher up you trek, it’s more likely to be the latter. Make sure to bring enough toilet paper for your entire trek and always have hand sanitizer nearby. As for showers, they’re generally only available at the lower elevation tea houses and hot water is not always a guarantee. Wet wipes are your friend! Many of Nepal’s tea houses are run on solar power, providing a renewable and clean way to keep the lights on. Sometimes the power needs to be conserved, especially if it’s cloudy during the day, so expect for some power outages or afternoons where the lights won’t turn on until there’s enough energy to get everyone through the night. The electricity can also be disrupted by bad weather and wind. Some tea houses do have wifi for a small fee. Expect slow, dial-up-like speeds. Outlets are also available at the larger, concrete tea houses near towns, but just like the lights, may not always be running with electricity during the day. Expect limited to no power the higher up you go, although some tea house owners will let you use their power strip for $1-2/hr. If it’s a huge concern, bring an extra battery pack or small solar charger. Tea, tea, and more tea! The name isn’t misleading. Often the first thing you’ll be greeted with at a tea house is a warm cup of black tea with sugar. If you’re hiking in the rain, snow, or wind it’s the perfect way to relax. Definitely help yourself to the generous portions of dal bhat, Nepal’s local dish that literally means “lentils and rice.” Mostly vegetarian, but sometimes served with meat on request, this dish is a daily staple across Nepal. If the tea house is under staffed, or there are an abundance of trekkers, guides and porters will often hop in the kitchen to lend a hand. Have some extra rupees on hand to purchase candy bars, beer, or other snacks. The plywood walls separating rooms are very thin - a good pair or two of earplugs can do wonders. Fleece pants and comfy sandals are key for post-hike relaxation. Portable solar lights can provide some extra light if the electricity goes out (or if you forget a headlamp). Cards and books are a great way to pass the time, and don’t forget to play a friendly game of spoons with your guides! Just keep an eye on the spoons, until you realize, there is no spoon….